A now, a quick break in our scheduled programming to bring you this update. YAY! 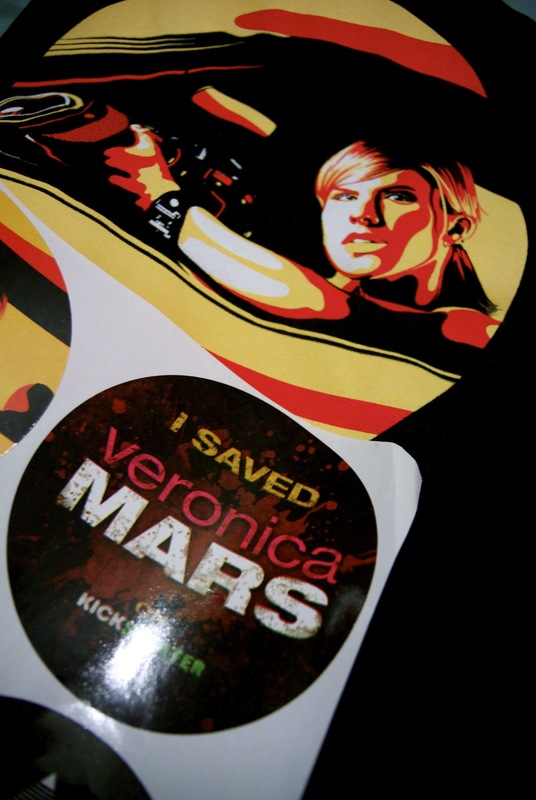 My Veronica Mars Kickstarter T-shirt has arrived! I have been giddy about this project since it was announced, and especially since starting and finishing my re-watch of the show. The teaser trailers they’ve been releasing have almost sent me into a euphoric fit and I. CANNOT. WAIT. I wasn’t as involved with the Veronica Mars fandom as some others (don’t ask) but I did start watching when season 1 was airing so being a part of it from the start is a good feeling. I’m just hoping that we get a fair share of the cinema release in the UK so I can go see it twenty times. We’re still waiting for Husband’s t-shirt (which is really my second shirt), and my signed poster which should arrive at some point closer to the release (if I remember correctly). I will 100% come to that VM marathon with you. Also my t-shirt came (same as yours) but I asked for the blinds one, so I’ve emailed to ask about that. I’m hoping they might send me a “replacement” and let me keep this one because I really want them both. Ooh, that means mine should be here soon! !